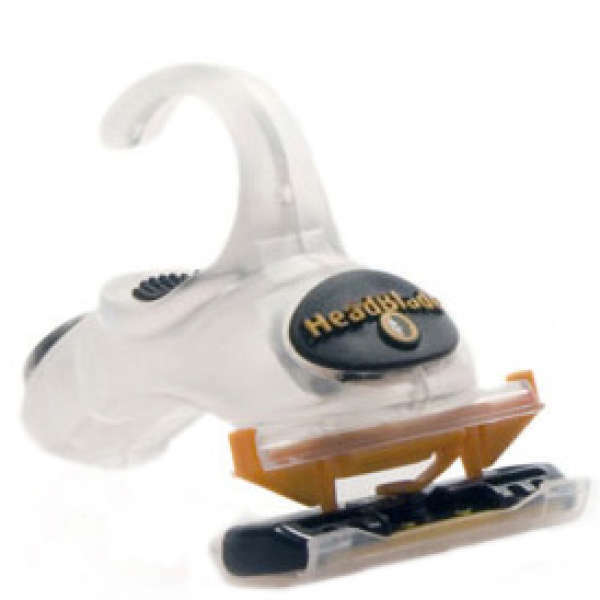 HeadBlade is an award winning scalp razor and an accompanying range of pre and post shaving products formulated specifically for head shavers. The funky and ergonomically designed razor sits in the palm of the hand in a way that gives incredible control over the movement of the blade, thereby reducing the chance of cuts and nicks. These days all uber trendy brands are making clear products that you can see through, so its no surprise that HeadBlade have produced a razor along the same lines. They call it the Ghost for obvious reasons and it comes with a Triple Blade and a lot of street cred!!! I bought the sports shaver with the wheels and was amazed how good it was, especially after trying to shave my head with a normal razor. It only takes a couple of attempts to get it spot on, but beware "only use the triple blades". My gf mistakenly bought me the double blades and i looked like a scene out of Carrie. I have to shave both ways to ensure all the stubble is gone, which can blunt the blades quicker, but make sure you have a nail scrubbing brush in your sink water to wash away the stubble that gets trapped, makes yr blades last much longer. Bought the Ghost shaver about a year later and its fantastic..who needs wheels !!! Looks great too and people always ask what its for..a conversation piece !! Have probably used about 12-16 blades in a year which is pretty good going, only shave my head twice a week so its better and easier to use than your conventional razor. Gave my old sports wheeled shaver to a colleague who loves it. Just remember, buy the triple blades to avoid a bloodbath ! !